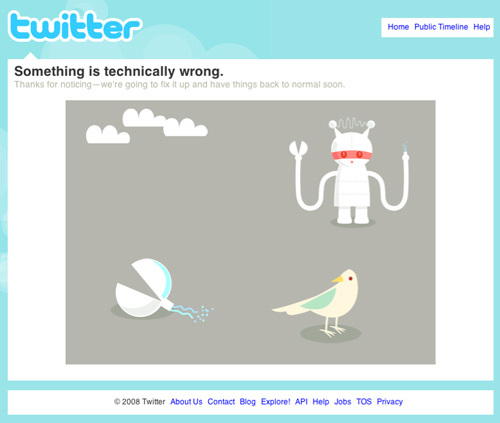 “Something is technically wrong” at Twitter, today and most every other day. I once read an article where the author claimed that “it does not matter WHAT technology you use. Worry about that WHEN your product is a success”. I guess Twitter is the continuing proof that this does not hold up? Maybe he wasn’t all wrong though. IF you have a success AND you’re able to monetize it - you can use those money to fix any remaining technical issues, right? It’s all just a matter of scaling the hardware and you’re good to go? Looks like that if you build your software using Ruby on Rails, you’re bound to be screwed for a long time if you’re successful and refuse to change platform. After all - Twitter isn’t Rocket Science, it’s a server based app with rather limited capabilities that is written in a high level language. I’m currently reading “Hackers and Painters” where Paul Graham (amongst other things) explore the ideal programming language. Given the condition that you have infinite computing power, high level languages are great according to Graham. The problem is that every level of ease for the programmer has a price. From machine-code, moving upwards through the various programming languages from machine code to C and eventually Lisp - every level of abstraction comes at the cost of slower execution. Twitter is running on Rails and it seems they just don’t have the required hardware. Or is it just hardware? To scale as much as Twitter needs to, is incredibly hard when it all comes to hardware. Wouldn’t it be great if Ruby had some features that could help this? The developers of Ruby are really certain about themselves. It’s like they have found the Holy grail of computing and have developed the ultimate language that never needs extending. That’s kind of like Paul Grahams basic idea and I wonder if the Ruby devs have read Paul Grahams book? It’s a fun read that’ll provoke and entertain when it comes to nerds, computers and designing programming languages. PS: I sure hope they fix Twitter soon. I’m really missing it and three months ago I didn’t even use it. Now THAT’s strange!